On the screens all around us, the cover image of Joy Division’s Unknown Pleasures explodes into three-dimensional life. 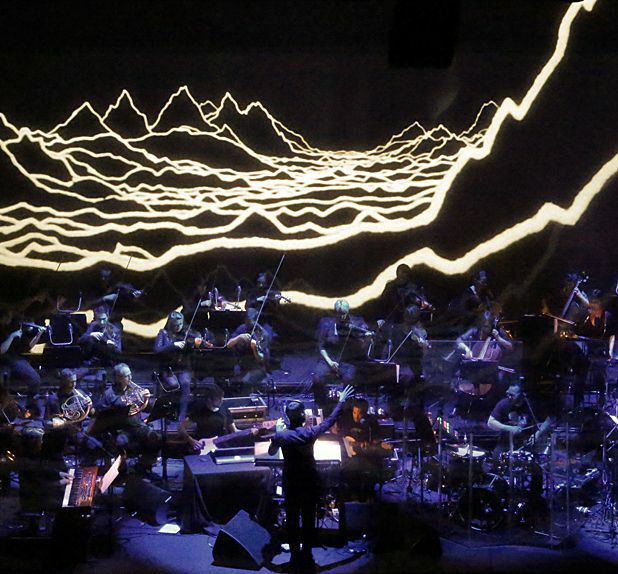 Peter Saville’s mountainous monochrome representations of the radio waves from a distant pulsar are an iconic visualisation of the Manchester band's stark yet expansive sound. But here – multiplied, layered on top of one another, in frantic motion – the almost tired sight of them as a reappropriated signifier of old-fashioned punk cool from the days of analogue is given new life. Premiered early in 2012 as a Brighton Festival commission, this multimedia, cross-genre hijacking of the band is no respecter of reputations or expectations. Dreamed up by sound artist Scanner in conjunction with the wilful experimentalists of the Heritage Orchestra under conductor Jules Buckley, the large ensemble is completed by a three-piece band incorporating guitarist Matt Calvert and drummer Adam Betts from Three Trapped Tigers alongside bassist John Calvert from Ghostpoet’s band. Over 80 minutes, it tears the conventional sound of Joy Division to shreds and rebuilds it around the familiar, melancholy spine of particularly urban fatalism the band dealt in. Amidst the sit-down formalism of a classical concert, the music is often abrasive and always loud, even when the arrangements are minimal. Fittingly, there was no sense of politeness or undue reverence to tracks like ‘Transmission’, ‘Digital’ or ‘Dead Souls’ as the simplest of instrumental figures were requisitioned in service of monumental symphonies married with a sometimes cathartically punishing electronic machine grind. In tandem with the music's greatness amidst a project which could have been derailed by the slightest tonal miscalculation, those visuals by Matt Watkins – creative director of the Gorillaz project for Jamie Hewlett – were key. Projected both onto the back of the stage and upon a gauze hanging between the musicians and the audience, they matched the expansive ambition of its audio element. Yet the finale was wrong-footing and resonantly understated compared to the powerfully textured array of sounds that had gone before, just a light orchestral figure overshadowed by a delicate, twinkling light-show and the disembodied voice of Ian Curtis crooning an ever-haunting ‘Love Will Tear Us Apart’. Homage to the emotive and musically rich songs of the 80s post-punk gods.